Following the consultation and treatment your therapist will be able to advise you on how many treatments you may require to achieve your desired results. You can enjoy the benefits of a Cosmo Facial Treatment on a regular basis or as a special treat. Everyone can benefit from the treatment but anyone suffering with skin disorders would benefit from regular treatments. In addition to a consultation with your therapist, the treatment lasts approximately one hour and 20 minutes. 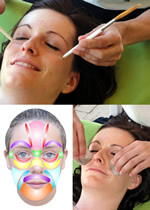 What makes Cosmofacial Treatment different? This Elemental Facial Therapy is among the latest of cosmetic treatments and takes into account oriental and meridian theory which states that the condition of the body’s functions has a direct relationship with facial skin tissue and muscle tone. Cosmofacial Treatment therefore stimulates the body to heal internally as well as improving the complexion by using precise techniques with creams, oils, masks and salts that are full of nourishing and healing vitamins and minerals. Cosmofacial Treatment is a holistic facial that treats you from the inside-out leaving you feeling deeply relaxed with a greater sense of wellbeing as well as giving you a glowing complexion and improved muscle tone. Cosmofacial Treatment is a new concept for facial treatments that has been developed from Facial Reflexology which combines Chinese meridian, South American Indian and Oriental body maps on the face with up-to-date neurology. Facial Reflexology has been developed over a 25 year period and has been used on thousands of people. The Cosmofacial Treatment’s concept incorporates the best possible pure, organic products from the earth’s natural resources. Applied professionally with brushes and salt stones the treatment is totally unique, the subtle scent from the oils used means this treatment has so much to offer.